For once, I was scheduled to be commentator on two consecutive wedding masses in one afternoon. And one surprise there was that I was totally unaware that I was to take on the second wedding. It was only when the scheduled lector told me that she had back-to-back weddings that afternoon did I bother to look at the day's schedule. Well, lo and behold, there was a bracket to both weddings pointing to my name! Ah well, I thought, at least I didn't have problems with the two weddings' mass readers since a lector was already there. As has been my customary practice, I would go to the altar before the wedding. The marriage contract which would be signed later by the wedding couple, parents and sponsors would be laid on top of the altar. I would read and copy the names of the bride and groom. 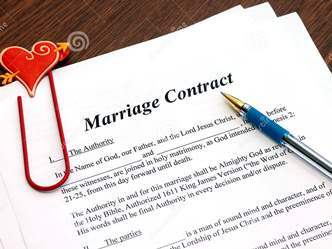 Note that the marriage contract, being a legal document would have the legal names of the couple. So I'm always confident on getting the names there, rather than just asking around. I write the names because there are parts of my commentator script where I announce them. The surname of the groom is also important. There was a time when the priest introduced the couple as "Mr. and Mrs....." He actually turned to me to tell hem the groom's surname. Luckily, I had it written down in my notebook. For some strange reason, the officiating priest referred to the groom as "Joseph". I couldn't understand this because the name written on the marriage contract is "John Paul" - and this is the name I used in the introduction for the wedding processional. I would think nicknames like "John" or "Paul" or "JP" (Jaypee) or even "PJ" would be possibilities, but "Joseph"? Where did that come from? I was even observing the groom's parents if they had a reaction whenever the priest mentioned "Joseph". There was no visible and objecting reaction. Ah well, I just thought that maybe the priest knew otherwise. In this wedding, apparently the wedding couple had a mass reader. He's a young gentleman and I assume the lector who was available was able to orient him for the First Reading. For what I remembered, he did fine with the First Reading and Responsorial Psalm at the ambo. When the wedding mass concluded, I exited towards the sacristy. On my way out from the other end of the sacristy, I saw the same gentleman again at the ambo. He was calling out for the wedding pictorials! He had a a list, and group after group, he was calling out the batch of relatives, friends and guests who will be posing near the altar with the wedding couple for picture-taking. When I mentioned this to the mother-butler, she agreed that those announcements for pictorials should be done at the commentator's lectern and not at the ambo. The ambo is strictly reserved for scripture readings (First Reading, Psalms, Second Reading, Gospel) and sometimes for prayers - and nothing else. So I approached the guy at the ambo. I politely told him to go down from the sanctuary, cross the aisle and move to the commentator's lectern and then continue his calls for pictorials there. He didn't ask me why, although I was ready to point out the reason and just restrained myself.